It's really a sad day when Pakistan’s greatest poet and feminist icon, and some of her would-be successors, are standing at daggers drawn. Kishwar Naheed is one of the greatest Urdu poets of the 20th century, and perhaps Pakistan’s greatest living poet. She will turn 80 in 2020 and this year celebrates the 50th anniversary of the publication of her iconic ghazal collection, Lab-e-Goyaa (‘Speaking Lips’). Over her long journey as a poet and feminist, she has contributed many iconic poems which have entered the feminist history of Pakistan: ‘Pehla Sufaid Baal’ (‘The First White Hair’), ‘Karre Kos’ (‘The Stiff Two Miles’), ‘Clearance Sale’, ‘Hum Gunaahgaar Auratein’ (‘We Sinful Women’) and ‘Men Kon Hoon’ (Who Am I). Her iconic autobiography, Burri Aurat ki Katha (‘The Story of a Bad Woman’), is not just the autobiography of a poet but the story of a whole generation. Her latest collection of poetry, Shireen Sukhani se Paray (‘Away from Sweet Talk’) contains many poems which especially relate to the plight of the contemporary Pakistani woman – or any woman for that matter. Poems about the defiance of Hazrat Zainab in the court of Yazid, Sheema Kirmani’s own defiance at the Sehwan Sharif shrine, on the female victims of Karo Kari, a dirge for the benighted Zainab Ansari of Kasur, an ode to Asma Jahangir, the plight of palace maids and surrogate mothers, her own foster-mother and much else. While this piece cannot do justice to Kishwar Naheed’s true literary stature, it’s really a sad day when Pakistan’s greatest poet and feminist icon and some of her would-be successors in the 21st century are today standing at daggers drawn. The trigger: Naheed’s critical comments on the Aurat March, and the response they generated from feminists involved in, or supporting that initiative. Let me quickly add that while I did not participate in the Aurat March, I have talked to some of its female participants and also exchanged opinions on it with other female comrades, and wholeheartedly own and sympathize with its slogans, demands and manifesto; in fact I even asked my sociology students to read up and research the slogans and manifesto of the Aurat March just the other day while teaching them about varieties of feminism. However, I have also personally been listening to Kishwar Naheed for well over a decade, and have had the honour of sharing a conference panel with her on at least two occasions, and have absolutely no doubt about her devotion and loyalty to the women’s movement and feminism. The question I would pose to both sides will be who benefits from this internecine warfare between the feminists of one generation and the feminists of another? My answer is short and simple: Patriarchy! It’s also sad to see the generation gap which is on offer and pretty evident in the manner Kishwar Naheed made her unfortunate remarks about the Aurat March and the quick, knee-jerk reaction of some of our feminist friends. This name-calling between feminists, the tags of ‘reactionary’ and ‘sell-out’ remind one of the sectarianism of the Left of old, which is one of the reasons why the Left is still so divided and nascent in Pakistan. I hope both Kishwar Naheed and our newly- and deservedly-energized feminist friends from the Aurat March iron out their differences, listen to each other, remove their misunderstandings and remove the disconnect plaguing them, which also plagues the Left in Pakistan more generally. This is the need of the hour. 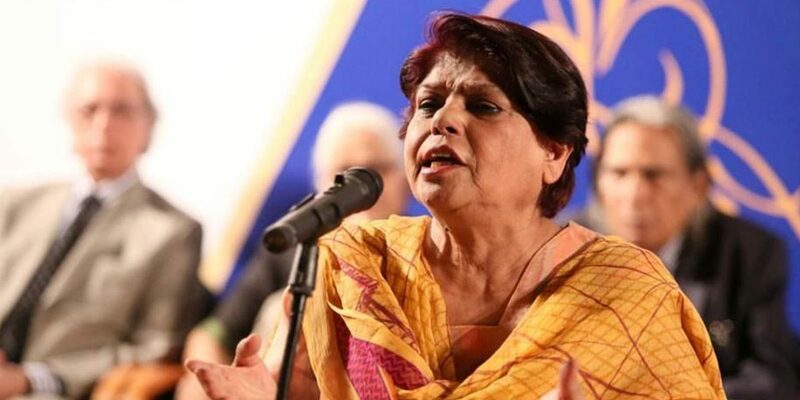 I also believe some of the more vocal radicals of the Aurat March need to critically engage with the voluminous work produced by Kishwar Naheed over more than 50 years, more fully and closely beyond her iconic poem ‘Hum Gunaahgaar Auratein’; there is apparently also a language disconnect, since Naheed has produced her work almost entirely in Urdu, while most of the Aurat March radicals, including those who were carrying and defending the slogans inscribed on placards at the march operate primarily in English. Note: All the translations from the Urdu are the writer’s own. 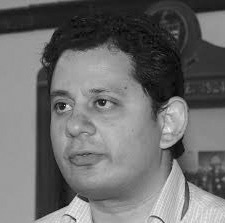 Raza Naeem is a Pakistani social scientist, book critic and award-winning translator and dramatic reader currently based in Lahore, where he is also the President of the Progressive Writers Association. He has written on, and translated the selected work of Ismat Chughtai, Fahmida Riaz and Razia Sajjad Zaheer. He can be reached at razanaeem@hotmail.com.